Posted by Florent Georges, on 2009-07-31, in exist, expath and xquery. Investigating into opportunities for an implementation of EXPath Packaging for eXist, I am looking at the way to implement extension functions with Java. I detail here the key points I found to write Java extensions for eXist using NetBeans. But those info should be generic enough to be used with any Java IDE. // implements the function "ext:hello($who as xs:string) as element()". In order to compile those files with NetBeans, you have to add two JAR files to the build path of the project you used for those files. Right-click on the project and choose Properties, then Libraries and the button Add JAR/Folder. You will find the JARs in the eXist install directory: $EXIST_HOME/exist.jar and $EXIST_HOME/lib/core/xmldb.jar. Then you compile your project to get the JAR file with your both class (the module and its single function) compiled. 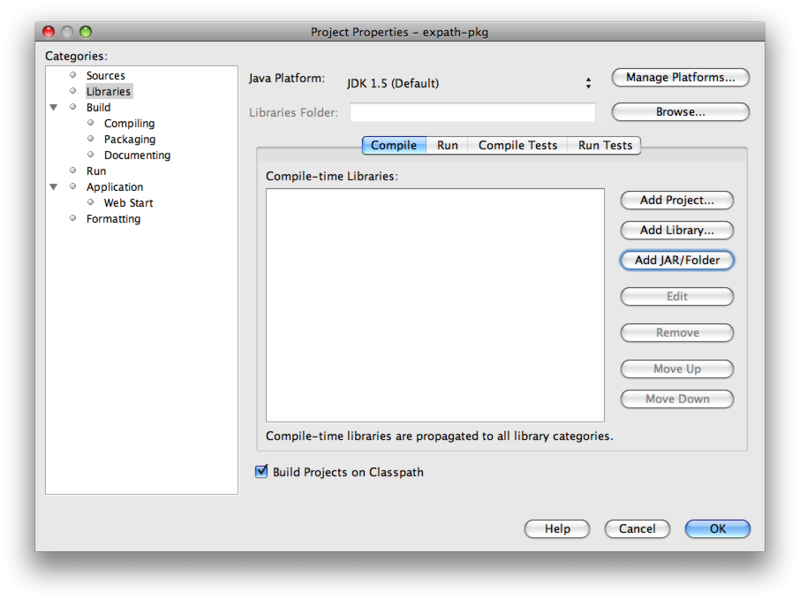 The best choice for the project's type is a library of Java classes. Posted by Florent Georges, on 2009-07-31T23:55:00, tags: exist, expath and xquery.